TESTIMONIALS: See what our customers have to say about our products and services. Sachin.Das@usa.xerox.com: "We receive quality products at competitive prices with prompt delivery. Totally satisfied." Janeglia@aol.com: "The felt tubes have arrived, many thanks. 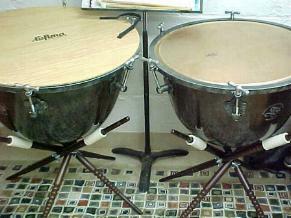 I am using them on the stands for my Baroque timpani and the fitting is perfect. Thank you for your help with this purchase! The tubes go around the wooden quad-pods and the timpani bowls sit on the felt, Never touching the wood again ... no scratches, dings, etc. They also absorb the weight of the bowl thus allowing the bowl to be "somewhat" free floating. Many many thanks. Cheers! Jim Neglia"
Zollo@cc.net: "We love the Felties !!!! "Yours is a very fine product at an excellent price, but your responsive customer service and super-fast shipping sets you apart from the crowd. Thanks again. I'm sure we will be back for more !" Mary Zollo"